In the midst of it all, after trading at a 24-year low 9.37 Friday morning, an abrupt reversal had the VIX ending the week at 10.70. Looking at the S&P500’s slight (0.3%) decline for the week, one might be tempted to think comfortably “boring.” Market internals, though, were anything but boring or comforting. Friday’s session saw the Nasdaq 100 (NDX) swing wildly. After trading to an all-time high 5,898 in the first hour of U.S. trading, the index sank over 4.0% to 5,658 before closing the session down 2.44% at 5,742. Amazon traded in an intraday range of 1,013 to 927. Looking at “FANG” plus Microsoft and Apple, major market cap was evaporating in a hurry. By the end of Friday’s session, Facebook had declined 3.3%, Apple 3.9%, Amazon 3.2%, Microsoft 2.3%, Netflix 4.7% and Google 3.4%. The semiconductors (SOX) traded at a multi-year high 1,149 early in Friday’s session, then sank 7.0% before recovering somewhat to close the day down 4.3% at 1,090. Biotech (BTK) rose 1.5% in the morning to an all-time high and then closed the session slightly lower. Yet it was not just Friday - and not only tech. After trading Tuesday morning at a low of 88.38, bank stocks (BKX) surged over 6% before closing the week up 4.9% to 93.79. The broker/dealers jumped 3.6% this week. The small cap Russell 2000 traded Tuesday morning at a low of 1,387 before rallying 3.3% to end the week with a gain of 1.2%. It was an unpleasant day and week for the Momentum Crowd all crowded into outperforming technology stocks. It was even worse for those long momentum and short the underperformers. Long tech versus short financials had been a big winner until the late-week “rip your face off” – with Friday trading seeing bank stocks up 2.3% and the Morgan Stanley High Tech Index down 3.0%. Long big technology against short small caps had also been easy money – until the last few sessions. This week saw the NDX drop 2.4%, while the small cap Russell 2000 gained 1.2%. And it’s worth noting some of Friday’s winners: Dillards (10.2%), Urban Outfitters (7.8%), J.C. Penny (6.8%) and Barnes & Noble (6.0%) - all heavily shorted in the despised retail sector. Moreover, the session's leading gainers in the S&P500 – including Kohl’s (7.2%), Chesapeake Energy (4.9%), Nordstrom (5.7%), Tractor Supply Company (4.7%) and Murphy Oil 4.7% – are popular short targets. It was a rotten day and a poor week for many long/short strategies. As for the ECB decision and the UK election, I’ll this evening posit the briefest of thoughts. Mario Draghi has been kicking the can down the road since 2012, and he clearly is in no mood to see what happens when his leg turns weary. We’ll apparently have to wait until later in the year to have a clearer understanding of the ECB’s stimulus program end-game. The Wall Street Journal ran an interesting pre-meeting article – with the catchy headline “ECB Critic Holds His Tongue as Race Nears for Bank’s Top Job” - discussing how the Germans have set their sights on the end of Draghi’s term in 2019. And why the big surprise over the dismal Conservative party showing in the UK election? Has there been any brightening in the underlying dour public mood? Folks suddenly content with the “establishment,” “elites” and the status quo? Feelings the “system” is working more fairly? Market and media complacency returned after Emmanuel Macron’s huge market-pleasing victory in the French presidential election. I would suggest the Mr. Macron owes his presidency and apparent mandate to Mario Draghi. I wouldn’t, however, wager on a long honeymoon period – let along some new golden age in French (and European) policy management. The political instability that had pundits fretting coming into 2017 is merely in a bit of remission. Wait until the ECB tap goes dry and the Draghi Bubble bursts. Closer to home, there was a new Federal Reserve “flow of funds” Z.1 report this week. From my perspective, interesting data raised more questions than were answered. Certainly not inconsistent with downshifting GDP (Q1 1.2% vs. Q4 2.1%), Credit growth somewhat fell off a cliff. Total Non-Financial Debt (NFD) growth slowed to a 1.4% pace in Q1, down from Q4 2016’s 2.8% to the slowest expansion in years. In seasonally-adjusted and annualized (SAAR) dollars, NFD expanded $676bn in Q1, down from $1.338 TN in Q4 and $2.406 TN in Q1 2016. Seeing such data, I would normally be chronicling a dramatic tightening of Credit Availability and financial conditions. It’s yet another example of these being the most abnormal of times. Household mortgage Credit expanded at a 3.0% rate during Q1, second only to Q4’s 3.2% going all the way back to the pre-crisis era. Consumer (non-mortgage) Credit expanded at a 6.5% pace, matching Q4 (strongest since Q3 ’15). Corporate borrowings bounced back strongly from Q4’s abrupt stall (0.2%). Q1’s 6.9% growth rate surpassed Q3’s 6.3% and was the strongest expansion of Corporate borrowings since Q1 ’16 (10.7%). Data just don’t speak to a tightening of Credit conditions. Q1 saw Federal government borrowings contract at a 3.3% pace and State & Local borrowings fall at a 3.5% rate. It was this atypical decline in government Credit that largely explains Q1’s tepid overall Credit expansion. At least at the federal level, a significant drawdown in deposits helps to explain the one-quarter hiatus from market borrowings. A Q2 bounce back in government borrowings should push system Credit growth significantly higher. To see booming securities markets in the face of 1.2% pace NFD growth is strange indeed. But while overall Non-Financial borrowings slowed to a crawl, the financial sector seemed to be frantically scurrying about. The Domestic Financial Sector’s “Net Acquisition of Financial Assets” surged an unusual SAAR $4.840 TN (vs. Q4’s $291bn and Q3’s $2.716 TN). After three straight quarters of contraction, Net Interbank Assets expanded an extraordinary SAAR $1.589 TN. The Financial Sector also increased Miscellaneous Assets SAAR $1.811 TN, while expanding Debt Securities holdings SAAR $452bn and Fed Funds and Repos SAAR $158bn. Depository Institutions’ Loans expanded a robust SAAR $924bn during Q1, up from Q4’s SAAR $595bn but somewhat below Q1 ‘16’s booming $1.241 TN. Clearly, booming asset markets had much more to do with a booming financial sector than a robust real economy. It would be quite unusual for booming markets not to provide some degree of economic stimulus, though bubbling markets create myriad fragilities. Securities markets remain the epicenter of this cycle’s historic inflation. Q1 saw Equities increase a nominal $939bn to a record $40.755 TN. This boosted Equities as a percent of GDP to a record 214%. This compares to the previous peak levels from 2007 and 1999 of 181% and 202%. Total Debt Securities increased nominal $320bn during Q1 to a record $41.464 TN. Debt Securities-to-GDP at a near-record 218% has been relatively stable over recent quarters. Total (Debt and Equities) Securities ended Q1 at a record $82.220 TN and a record 432% of GDP. This compares to the cyclical peaks of 379% at Q3 2007 and 359% at Q1 2000. The Household Balance Sheet continues to be a centerpiece of U.S. Bubble Economy analysis. U.S. Household Assets ended Q1 at a record $110 TN, increasing $2.383 TN during the quarter. And with Household Liabilities up $36 billion (to $15.152 TN), Household Net Worth surged another (remarkable) $2.347 TN during the quarter to a record $94.835 TN. It’s worth noting that Household Net Worth has now inflated $39.1 TN, or 70%, since Q1 2009. Over the past year, Net Worth inflated $7.259 TN, or 8.3%, one of the largest one-year gains on record. By major component, Household Financial Assets increased $1.781 TN during Q1 to a record $77.115 TN, with a notable one-year rise of $5.734 TN (8.0%). At 125% of GDP, Real Estate holdings gained $499bn during the quarter to a record $26.866 TN, with a large one-year rise of $1.794 TN (7.2%). Q1 Household Net Worth reached a record 498% of GDP. For comparison, Net Worth/GDP ended the (“decade of greed”) eighties at 379%, Bubble year 1999 at 446% and peak mortgage finance Bubble 2007 at 461%. Unless something dramatic unfolds over the next few weeks, Net Worth/GDP will have cruised through 500% during Q2. It’s worth noting that Household Total Equities (equities and mutual funds) holdings have doubled from 2009 levels to approach the record 129% of GDP from year-end 1999. Helping to offset tepid domestic Credit, Rest of World (ROW) had strong Q1 flows into U.S. financial assets. At SAAR $1.200 TN, Q1 ROW flows compare to an outflow of SAAR $187bn in Q4 and an inflow of SAAR $501bn in Q1 2016. Curiously, Treasury purchases (SAAR $344bn) dominated flows into U.S. debt securities and were the strongest since 2014. Purchases of U.S. corporates slowed to SAAR $132bn, down from Q4’s SAAR $433bn. After big Q4 outflows (SAAR $480bn), ROW increased U.S. equities holdings SAAR $219bn during Q1. It’s difficult to comprehend that ROW holdings of U.S. financial assets have grown to almost $25 TN, inflating about ten-fold from the mid-nineties. Returning to the markets, players will spend the weekend pondering whether Friday’s tech swoon was a mere flash in the pan or the beginning of something more serious. That intense selling manifested from market dynamics rather than in response to some news event might make it more difficult to spin. Rotations have become a common feature of this speculative marketplace, and the bulls will spin rotations positively. This week saw previous underperformers gain momentum, while the highflyer Wall Street darlings saw melt-ups rather abruptly indicate potential trouble below. When the Crowded Trade phenomenon has finally reached the top of the food chain – to a select group of speculative favorite megacaps - a big rotation away from the darlings will present a formidable market challenge. From my vantage point, such dynamics are consistent with equities (and risk markets) working toward putting in a major top. The German chancellor had been hoping to isolate Donald Trump on climate issues at the upcoming G-20 summit in Hamburg. But Merkel's hoped-for alliance is crumbling, underscoring Germany's relative political weakness globally. Many countries are wary of angering the United States. German Chancellor Angela Merkel had actually thought that Canada's young, charismatic prime minister, Justin Trudeau, could be counted among her reliable partners. Particularly when it came to climate policy. Just two weeks ago, at the G-7 summit in Sicily, he had thrown his support behind Germany. When Merkel took a confrontational approach to U.S. President Donald Trump, Trudeau was at her side. But by Tuesday evening, things had changed. At 8 p.m., Merkel called Trudeau to talk about how to proceed following Trump's announced withdrawal from the Paris climate agreement. To her surprise, the Canadian prime minister was no longer on the attack. He had switched to appeasement instead. What would be wrong with simply striking all mentions of the Paris Agreement from the planned G-20 statement on climate, Trudeau asked. He suggested simply limiting the statement to energy issues, something that Trump would likely support as well. Trudeau had apparently changed his approach to Trump and seemed concerned about further provoking his powerful neighbor to the south. The telephone call made it clear to Merkel that her strategy for the G-20 summit in early July might fail. The chancellor had intended to clearly isolate the United States. at the Hamburg meeting, hoping that 19 G-20 countries would underline their commitment to the Paris Agreement and make Trump a bogeyman of world history. A score of 19:1. If even Trudeau is having doubts, though, then unity among those 19 is looking increasingly unlikely. Since then, the new formula has been to bring as many countries as possible together against one. The first cracks began appearing on the Thursday before last. After returning from the G-7 summit in the Sicilian town of Taormina, Merkel had sent a clear signal to her team: "We have to stay together, we have to close ranks." But even before Trump announced the American withdrawal from the Paris Agreement that evening in the White House Rose Garden, it had become clear in Berlin that they would miss their first target. Led by the Italian G-7 presidency, the plan had been for a joint reaction to Trump's withdrawal, an affirmation from the remaining six leading industrial nations: We remain loyal to Paris. Suddenly, though, Britain and Japan no longer wanted to be part of it. British Prime Minister Theresa May didn't want to damage relations with Trump, since she would need him in the event of a hard Brexit, the Chancellery surmised last week. And given the tensions with North Korea, Japanese Prime Minister Shinzo Abe couldn't put his country's alliance with the U.S. at risk. In other words: Climate policy is great, but when it comes to national interests, it is secondary. In the end, the Germans, French and Italians were on their own. The G-6 had become the G-3. It is a defeat for Merkel, and not just when it comes to climate policy. It is also a setback for her claim to leadership on the global stage. Germany's geopolitical influence, the incident shows, remains limited. When it comes to power, security and interests, Germany is a not a global player, but a mid-sized power that isn't even able to keep Europe together. The German chancellor may have become the hero of liberals and democrats around the globe, but she is unable to fulfill the expectations placed on her as the putative "leader of the free world," at least not when it comes to power politics. Even Merkel's psychological deftness in dealing with the posturing potentates of the world isn't enough to make up for the fact that Germany is not a global power when it comes to foreign and security policy. America, it seems, will remain the world's power broker for the time being. When the most powerful heads of state and government gather in Hamburg in less than a month, that fact could make things difficult for the event's German hosts, and not just when it comes to climate policy. The international situation hasn't been this unclear in a very long time and it is impossible to predict how the meeting participants will act and how the summit will unfold. There are "so many fault lines," says a source in the Chancellery: The battle for free trade and protectionism, the war in Syria, the Qatar crisis and the ongoing fighting in Ukraine all pose a threat to summit bonhomie. In internal discussions, a list of unpredictable variables has been drawn up. At the very top is Donald Trump. Indeed, the U.S. president's first meeting with Russian President Vladimir Putin threatens to overshadow the entire summit. Merkel had hoped that the two would organize a meeting prior to the Hamburg summit so that their encounter would not become a central issue. But now, all eyes are likely to be on the face-to-face meeting between the leaders of America and Russia, particularly given that the investigation into the Trump campaign's possible ties to Moscow is gaining steam in Washington. In Berlin, preparations for the summit are continuing full speed ahead, with the Chancellery focusing primarily on the preparation of two documents. One is the summit's official closing communiqué, which all 20 heads of state and government are to sign. The document is to reflect Merkel's stamp on the summit, and it focuses on a broad array of issues from trade to Africa to women's rights. Several drafts have circulated among the G-20 members in recent weeks. Of particular note: There isn't a single mention of the climate in the document. There is a decent possibility that, if the U.S. is to sign it, the closing document will remain completely silent on climate issues. In parallel, though, Merkel's advisers are working on an "Action Plan on Climate, Energy and Growth," a document that had initially been planned for the 19 in Merkel's original 19:1 calculation. But hope is fading that enough heads of state and government can be found to sign the document. Thirteen pages long, the paper asks signatories to commit themselves to "the restructuring of energy systems consistent with Paris" and to their "nationally determined contributions" to cutting greenhouse gas emissions. For the Americans, the document is an imposition. It includes a number of items in which the Paris Agreement is expressly affirmed and substantiated - the pact that Trump has just withdrawn from. "Our actions are guided by the Paris Agreement," the document states, the goal of which is that of "holding global temperature increases to well below 2 degrees." The paper also discusses the reduction of greenhouse gas emissions by 2050 and the $50 billion that industrialized nations have pledged to make available to help developing nations reach their targets. An array of items that, as has recently become apparent, Trump has little use for. Officials in Brussels are cautiously optimistic. "We expect that the document will be signed by the 19 countries," says one diplomat involved in G-20 preparations. Nobody at EU headquarters, though, has any hope that the U.S. will join them. In Berlin, the mood is less confident. There are widespread concerns that a whole list of countries might pull back out of fear of the consequences for their relations with Trump - something they aren't willing to risk over the question as to how hot it might be on the planet in 100 years. Indeed, the Chancellery has begun recalibrating its view of success, now content to settle for a situation in which no other country joins the U.S. in withdrawing from the Paris Agreement. German officials believe there are several countries whose signatures to the document are by no means certain. Turkish President Recep Tayyip Erdogan, for instance, could be on the search for revenge following the dispute over German parliamentarians' rights to visit German troops stationed in Incirlik. The Saudis, meanwhile, might jump ship because of the multibillion-dollar defense deal they just signed with Trump. Moscow, meanwhile, has signaled to the Chancellery that Russian President Vladimir Putin stands behind Paris and would sign the document. But can he really be trusted? Merkel has spent a lot of time on the phone in recent days and has also been traveling. This week, she visited Argentina and Mexico, both of which are allies when it comes to climate issues. Just how difficult it is to keep partners together on climate protection issues was on full display to Merkel last Friday in Brussels. Chinese Prime Minister Li Keqiang was in the EU capital and was eating dinner with European Council President Donald Tusk and Commission President Juncker just as Trump announced his withdrawal from Paris. The trio didn't bother to turn on the television since they already knew what the U.S. president was going to announce. Indeed, they had planned to issue a joint response the next day at the EU-China summit. They had negotiated a summit declaration in which both sides would call for a significant intensification of the fight against climate change. High-ranking EU officials had already begun crowing that the statement was the response from China and Europe to Trump's effrontery. But it never happened. It wasn't because the two sides disagreed on climate issues, but there was discord surrounding a different part of the statement dealing with trade policy. Ultimately, the disagreement could not be resolved and Juncker, Tusk and Li appeared before the press after a three-hour delay - and without a joint statement on the climate. Indeed, trade policy is likely to be another significant sticking point at the G-20 summit in Hamburg. The Europeans got an indication of what is likely in store for them on Wednesday and Thursday of this week at the ministerial meeting of the Organization for Economic Cooperation and Development (OECD). The U.S. declined even to support sentences that merely repeated the minimal compromise that Trump had grudgingly agreed to in Sicily. The G-7 had only been able to find common ground on a few thin statements criticizing predatory pricing or condemning overcapacity in steel production. In the closing document of the OECD meeting on globalization, there is now no mention at all of trade or climate. As such, the G-20 could result in something that hosts of the event normally do all they can to avoid: open discord. On the issue of climate, the decisive question will be whether the Germans are willing to seek conflict with Trump. But it currently doesn't look as though they are, with government officials eager to avoid turning the climate statement into an instrument of power politics. Instead, Merkel is likely to retreat to a role that suits her better anyway: that of mediator. As the host, officials say, Germany will focus on playing intermediary at the summit. On the other hand, though, Merkel also isn't interested in the type of compromise proposed by Trudeau. After the G-7, she said that climate protection was too important to her to engage in compromise. Ultimately, the end result could be that the issue is largely ignored. The G-20 isn't a climate conference, officials are saying, and the conflicts might be better suited for the next global climate summit, scheduled to take place in Bonn at the end of the year. The German population, of course, would almost certainly prefer to see the chancellor stand up to Trump. If Merkel, who has staked a significant portion of her political legacy on climate change, were to exclude climate from the G-20 summit, she could face accusations of caving in to the U.S. president. And in a campaign year, that's not a good look. Indeed, the center-left Social Democrats are already positioning themselves to benefit. "It would of course be good if as many participants of the G-20 summit as possible were to reconfirm their adherence to the Paris climate deal," says Foreign Minister Sigmar Gabriel of the SPD. "Silent consent in opposition to the climate deal cannot be the message sent by the G-20." Of course, the rise in cash (liquidity) that the Federal Reserve is determined to remove was also far greater and far faster than at any time, which is why the market has been so irrationally exuberant. The market has never been this juiced for this long, and it was all built on the Fed’s free money, now quickly fading away. Look at the worst market crashes and the bull runs that preceded them, and you’ll never see a sharper, more exuberant upturn at the end of those runs than the Trump Rally. NEVER! I’ll prove it below. Now the market is flatlining, the euphoria has ended, but that, too, is typical of all major tops before major crashes. None of them instantly blew off and crashed. The fall of the cliff has ALWAYS come after a short term of a few months during with the top flattened out, usually followed by a choppy downward turn, and FINALLY the market suddenly leaped off the cliff a few months later. We’ve had three months now of such a top. So, the end is fully poised to happen. Clearly, before each major crash, the pitch of the market steepened for a heroic last hurrah. The last hurrah is now in! It’s fully there. You can see it. It’s gained as much altitude as any hurrah that ever preceded it. The fact that it did so in half the time of all previous euphoric bouts only makes it ALL THE MORE EUPHORIC! Again, I repeat myself because so many experts are failing to see this, and it SO OBVIOUS! There is nothing more irrational than experts coming out of a period of the most extreme exuberance in history and not even being able to see it at all. Moreover, those promises would have to materialize in nation that is more sharply divided politically (on the streets and in congress) than it has been since the Great Society changes of LBJ. So, those promises face huge political battles, which they must overcome before they ever become reality. Stock market crashes do not ever play out all at once. So, don’t expect just because I’ve predicted the crash will begin in June or July that the stock market is just going to go BOOM! off a cliff. Historically, the stock market has never fallen that way. Look again at the chart above, and you will see that the tops after the period of irrational exuberance can run horizontal for a long time or take a bumpy ride that rounds ever more steeply downward. They decline from a peak for awhile before reality overcomes investor denial and all the investors finally leap off a cliff like lemmings in what becomes that 20%-or-greater plunge that crashes become famous for (the Black Monday, Black Tuesday or October Surprise kind of event), which technically turns a bull market into a bear market. And, yet, the professional market bulls (the investment analysts) say, “Where’s the irrational exuberance? We haven’t seen any of that yet! We can’t have a huge crash without that!” So, I think, Oh my gosh, Dude’s, can you really be that dumb? You’re standing up to your eyeballs in a manure pile, and you’re so irrational you can’t smell the stuff that’s already covering your nose or see it while it laps around your eyelids. Surely, this is set to be the biggest wipeout in history when irrationality is that severe. I told her that housing was on a breaker that was going to destroy the banking industry on a global scale within months! I convinced her that it would be the worst thing WE had ever seen (having not lived through the Great Depression). Half a year later, Bear Sterns went down. Three months or so after that Lehman Bros. died, and the rest is history; but ol’ Ben Bernanke was singing of eternal glory days for housing all the way up to a month before Bear Sterns died. Fortunately, her family sold the estate before all of that went down. - Weak NFP numbers out on Friday, along with revisions downward for previous months. - The selling pressure on the dollar continues. Further bad economic pressure could turn this orderly decline into a major drop. - GLD has almost recovered all of its losses, and will look to take out the mid-April highs. - Fed rate hike looks to be priced in to GLD prices. First of all, I hope everyone enjoyed a happy Memorial Day Monday long weekend with family and friends. With the shortened trading week in the US markets, we really didn't get any major news affecting gold prices, except the NFP numbers out on Friday, and the revisions that come with it. Nonetheless, GLD didn't stay flat, but continued to advance orderly through the shortened week, with a one-day gain of 0.78% on Friday to close the week out strong at 121.6. I normally keep readers updated by posting about GLD every week or so, especially if my outlook changes on the short-term movements. Fortunately, my bullish view hasn't changed since my article two weeks ago about the divergence in the expectations for a Fed Funds rate hike and gold prices. GLD has already advanced 1.8% since then. Unfortunately, I know some readers in the comments section mention that they look forward to my weekly updates, so I apologize for that. The real question is, what is ahead for GLD, especially as we get closer to the hyped-up June FOMC meeting, only a week and a half away? To answer this question, I'll be giving my perspective on macroeconomic trends in the US economy, news regarding the Fed and various Fed presidents, movements in the currency markets and bond market, technical indicators, and how they influence GLD. 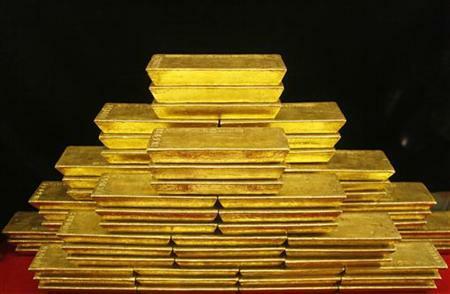 Probably the single biggest mover of gold is the dollar, which moves inversely to gold due to the dollar's status as the current reserve currency and safe-haven competitor to gold. They also compete through opportunity cost, with the dollar offering interest and gold offering a hedge against inflation, which weakens the dollar. This week marks more weakness for the dollar and more strength for GLD. 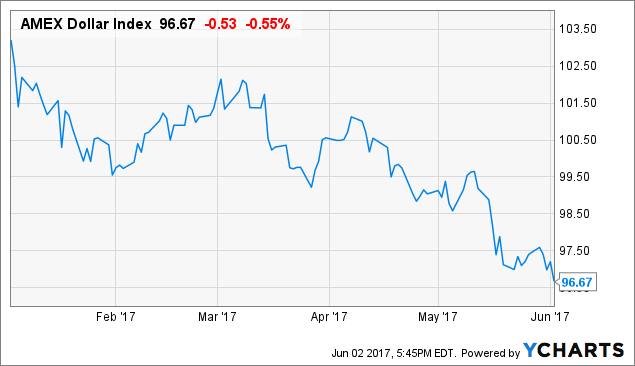 Since the beginning of the year, the dollar index has fallen more than 6% from 103 to less than 97. Uncertainty about the US direction under Trump continues to linger. The fundamentals for the US don't look very solid. There are the stories of involvements with Russia, geopolitical tensions seem to weigh on the dollar with every news article, and just this week, we got news that Trump pulled out of the Paris climate accord. All of these factors have contributed to the dollar's decline. The major factor, however, has been Trump's weak dollar policy. From talking with reporters about how he thinks the dollar is too strong, to having his top trade advisor accusing Germany of manipulation of the euro, to threatening to label China a currency manipulator, to accusing the Japanese of devaluing the yen vs. the dollar, Trump has been active in talking down the dollar. Of course, the idea here is that Trump thinks that our exports will be more competitive if we have a weaker dollar, that foreign buyers will import more US products and we will reduce our trade deficit. Unfortunately, that probably won't happen and our trade deficits will balloon out of control, instead. Just look at the events that transpired when George Bush took office from Bill Clinton. The dollar was at record highs around 110, and then for the next eight years while he was in office, it collapsed. Meanwhile, our trade deficits exploded. The reason for this is because the US is mostly a service economy, and relies heavily on imports from foreign nations. As the dollar weakens, Americans still depend on these manufactured goods across seas, and they end up paying more for those products because their currency is weaker. This phenomenon will likely repeat itself under President Trump and doesn't bode well for the US economy or the dollar. 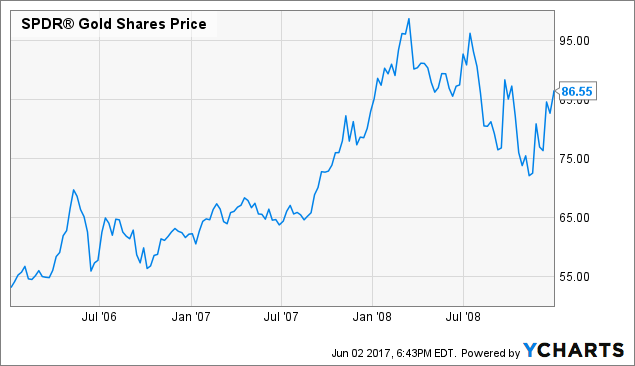 Another dollar decline under Trump like we had under George Bush would spell massive gains for GLD. Under the Bush years, spot gold increased from around $250/oz to $800/oz for a 220% gain, while GLD increased more than 70% from under 55 to 86 from its inception until Bush left office. 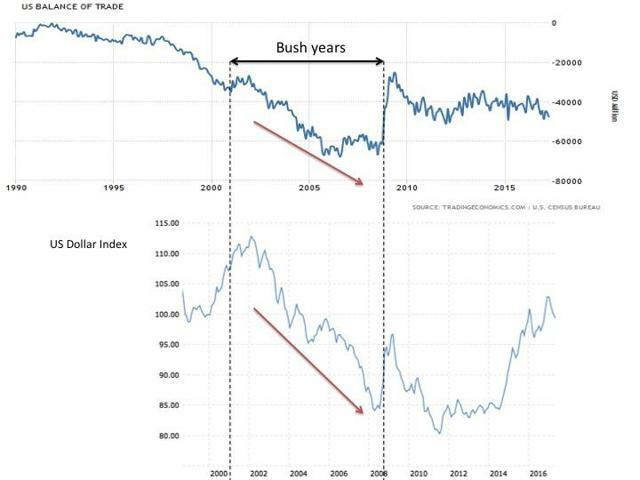 Since the GLD ETF began in 2006, GLD investors weren't able to capture the huge moves in gold during Bush years, but we will be able to take the full percentage of the moves as the dollar weakens under Trump. As for this week, GLD continued to strengthen on the back of a weak dollar. The trend looks strong here and I think it will likely continue next week. So much for all the hope and optimism for great NFP numbers. 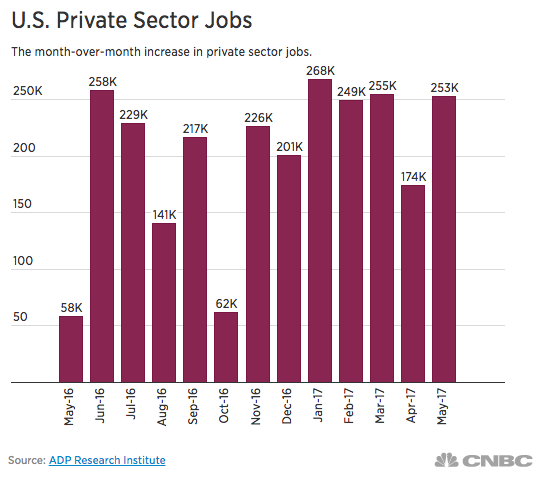 As has been the recent trend, the ADP numbers give the markets false hope of a great NFP report, only to have it disappoint. 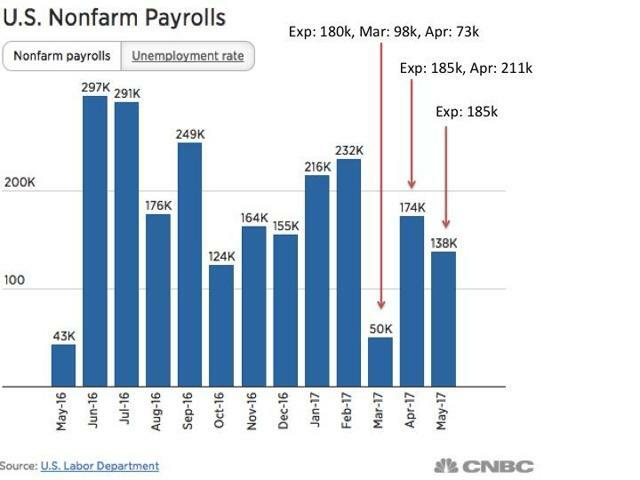 The consensus for May NFP was 185k, but we got 138k jobs added instead. Look for this number to come down as we get more revisions in the months ahead. We also got heavy revisions downwards from prior months. The huge April jobs number of 211k was revised down to 174k, and the weak March number, which came out at 98k, was revised to 73k and has been revised even lower now at 50k. Disappointing NFP tends to propel GLD higher. The narrative here is that weaker NFP means a weaker economy, less rate hikes by the Fed, a weaker dollar from low interest rates and stronger GLD. The underlying fundamentals for the US labor market don't look good either. If we are adding part-time jobs at the expense of full-time jobs, that is not a plus for the economy. The fall in unemployment, while it looks good on the headline, was due to lack of participation. As more people become discouraged in finding work and discover that Trump's promise to bring back jobs hasn't materialized, they are once again leaving the labor market. This explanation also accounts for why we haven't been seeing wage growth. Part-time jobs, low-paying jobs, do not contribute to wage growth. Discouraged workers do not contribute to wage growth. It's no surprise that confidence numbers have also been falling from their highs during the Trump trade. On the back of the weak jobs number, the Fed Funds futures have lowered their expectations for three rate hikes this year, despite the narrative from Janet Yellen that she thinks that bad Q1 numbers are "transitory." According to the CME Group's FedWatch Tool, the market thinks there's a 94.6% chance of an interest rate hike in the June meeting, despite all of the poor economic data. I do believe we will be getting a hike in June, and there won't be a surprise because Fed officials are still talking about three interest rate hikes this year. Just a few days ago, the Dallas Fed President Kaplan said that he's sticking to his guns and is calling for two more hikes this year. I mean, I don't believe him, but what it does say to me is that the Fed is hawkish enough to basically tell the markets that there will be a hike in June. This information has now been baked into the price of GLD. It is just that expectations for future rate hikes, such as one during the September or December meetings have dropped. Higher interest rates may act as a resistance in GLD, but lower interest rates, even in the future, mean a weaker dollar today and stronger GLD. 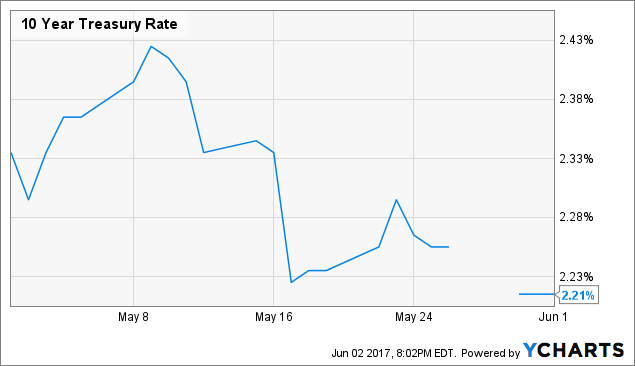 The 10-year yield also fell as expectations of future interest rate hikes fell. The Fed has been talking about unwinding its balance sheet. If it does go through with this, yields will rise as they taper off their rollovers. However, with the current planned cap, such small rollovers will not have a major effect on interest rates, especially if inflation picks up. I don't see GLD prices being heavily influenced by this "tapering" of the balance sheet. Based on the technicals for GLD, there is more steam in this rally. Since the beginning of the year, we've been seeing higher highs, as indicated by the blue circles, and higher lows, in the black circles. This is the classic indication of a bull market. I think we're going to be breaking $1300/oz this time around, and take out the last high back in mid-April of around $1290. The RSI, while climbing past 60, has yet to cross the 70 level, and can sustain there for some time, especially if GLD moves favorably after the June rate hike. 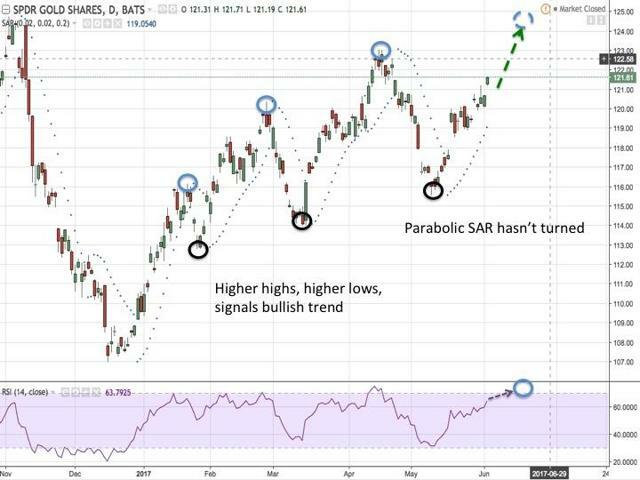 The parabolic SAR hasn't turned to show any indication of a time to sell. The technicals seem to show more upside ahead in GLD prices. This time around, we have not seen a decline in GLD prices as Fed Funds futures have increased. There is less certainty about how GLD will move post-FOMC meeting as it is no longer a buy the rumor sell the fact trade that I've written about frequently before. What I am confident in is a dollar that continues to weaken and fundamentals in the US that continue that trend as well. There may be short-term fluctuations before and after the Fed meeting, but I think GLD will be going higher. As we get closer to the FOMC meeting, there may be more clarity on how GLD will perform afterward. We remain in the same position as before, with the USS Nimitz scheduled to arrive in waters off the Korean Peninsula sometime this week. It seems unlikely to me that the Chinese will be able to produce a solution that satisfies both sides. In the meantime, North Korea is in the position that Saddam Hussein was in before both wars in Iraq. Giving in to the Americans could create a domestic political crisis and permanently weaken the regime. There is a possibility that the U.S. has no stomach for this war. There is also a possibility that North Korea could defeat the United States. Given the risks of capitulation, war may appear the more prudent move.